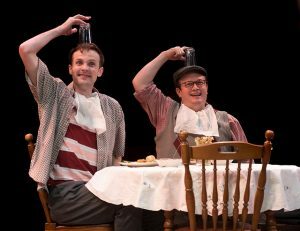 Arvada Center Provides Zany Tale Of Life In The Bleakness Of The Yorkshire Countryside. Regina Fernandez is naively cheerful as Emilie, the young English woman who arrives at a home in the Yorkshire Moors as the family’s newly hired governess. Although she knows no one in the family, she was impressed with the kindness and love she felt in letters she received during the application process. She is eager to be of service to the family. Governess beware! The two sisters, Agatha and Huldey, who greet her, are a duo to behold. Agatha is stern and tough as nails with no apparent kindness. The other, Huldey, is an overly-outgoing woman eager to find some cheerful companionship in her dreary life. She wants to have someone in the house with whom she can create a diary of their lives, someone who can make her feel important. The brother who hired Emilie via the mail is nowhere to be found. The “child” the nanny has come to take care of is nowhere to be found. 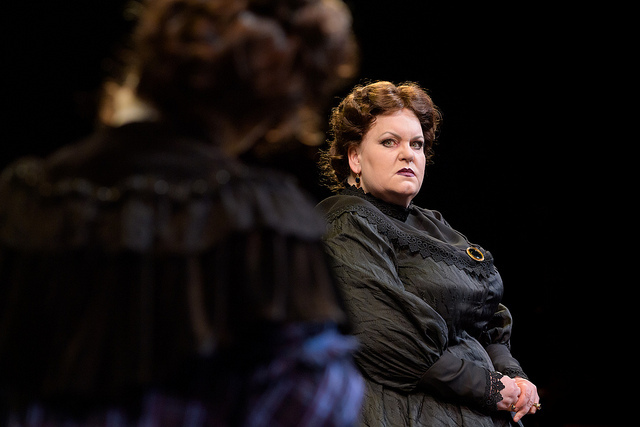 Two unfriendly housekeepers, Marjory and Madeline, want nothing to do with this new governess. Emilie is undaunted, however, and cheerfully asks what she might do for amusement in the area. She learns that a possible activity might include, “Taking a long walk in the dreary Moors, to be sucked up in quicksand or to be savagely attacked by wild animals.” Welcome to the Moors. Fans of the literary works of the Bronte Sisters (Charlotte, Emily, and Anne) may have a field day with playwright Jen Silverman’s take on what the sisters’ lives might have included. Early in her life, Silverman became hooked on the writing of the Bronte Sisters, especially “Wuthering Heights” and “Jane Eyre.” Somewhere along the way she began to fantasize what life might have been like for the sisters in their isolated childhood. Her imagination has gone rampant, and the very quirky and clever “The Moors” is a result. Announcement about the show claims “Wuthering Heights meets The Addams Family, with a romantic twist.” Well said. There is unabashed lunacy at every turn. The entire cast works wonders. Emma Messenger and Jessica Robblee are both convincing as the two sisters, Agatha and Huldey. Daniel Crumrine and Annie Barbour are wildly odd as the two housekeepers, Madeline and Marjory. Come to think of it, “Madeline” played by Daniel Crumrine doesn’t say a word. On the other hand, Annie Barbour’s housekeeper role is known as “Marjory” when she is handling some tasks in one room, as “Mallory” when working in another room. She has a lot to say, even suggesting that Huldey might just be happier if she killed her sister, Agatha. 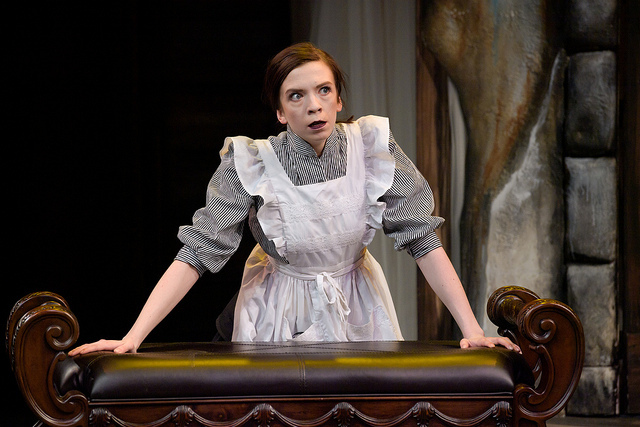 The maid convinces Huldey that if she got rid of Agatha, she would find the world-wide acclaim she so desires, noting. “Imagine the publicity of being a murderer?” So Huldey lurks around the house, meat cleaver in hand, eager to get Agatha out of the way. This is crazy. A bewildered new nanny, dreadfully unpleasant household employees, a bird and a dog that talk and have ideas of their own, two house-bound sisters – one being especially unpleasant, the other being too eager to find a friend. And a never-seen brother, and a never-again-mentioned child. The brother is reportedly locked up in the attic of the home, fed through an opening in the wall’s bricks. And did the stern Agatha plan Emilie’s arrival to provide her with someone to love? There are some adult themes here not suitable for young audiences. Director Anthony Powell has done great work in putting together this mélange of activity created by playwright Silverman. Powell lets Jessica Robblee pull out all the stops as Huldey, finding her ten minutes of fame – not in the English countryside, but as a rock star performer. The tables are turned on most of the cast, and the audience is kept wondering just what might happen next. No clues given here to “what happens,” but a suggestion that “the Moors” has more going for it than craziness. There is some clever insight on what makes us tick. Why do we want to feel important? Why do we long for friendships? Why do we need to find love? Why do we want to be in charge? And ultimately, what is life truly all about? The elves in Santa’s North Pole Workshop are a happy and busy crew, preparing toys for Santa to distribute worldwide. The fun begins. They are a clever sight to behold – all about three feet tall, spinning and dancing with glee. They are an efficient lot, all except one unusually tall and maybe not overly bright chap, Buddy. He overhears other elves discussing why he is not as efficient as they are. Speaking in hushed tones, they comment that Buddy’s probable problem is that he is “Human.” Buddy confronts Santa who confirms that he arrived at the North Pole after crawling into one of Santa’s bags as a baby on a long ago Christmas delivery. Santa has raised him as his own, but shares information as to where his true father lives. Buddy says “Goodbye” to the North Pole and heads for Manhattan to find his dad. 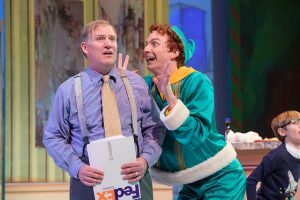 Josh Houghton is enormously talented as the six-foot-six inch elf, Buddy. Houghton can sing. Houghton can dance. Houghton can mime. Is there anything this wonder cannot do? His timing is impeccable. He is a non-stop whirlwind of delight, as he becomes the naïve, enormously tall, and wonderfully kind Buddy. When he reaches the New York City office of his father, Buddy is every bit as charming, fun, and nutty as he was among the elves at the North Pole. His father, well portrayed by Mark Devine, is not amused. The basic story is familiar to those who saw the 2003 movie starring Will Farrell as Buddy. A few changes have occurred in transferring the movie to the stage, but it is every bit as charming and endearing as that first glimpse we had of Buddy many years ago. 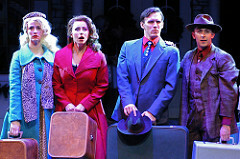 This stage musical version first appeared on Broadway in November of 2010 and has become a popular holiday season show. Arvada is giving this great gift to audiences this season. Opening night enthusiasm was high, and a sold-out season may be in store. Gavin Mayer directs this charmer, especially using the skills of Kitty Skillman Hilsabeck’s choreography and Laura K. Love’s scenic design. The stage turns into a large children’s book of colorful artwork – the North Pole, the Manhattan Skyline, Rockefeller Plaza Skating Rink, The Tavern on the Green Restaurant in Central Park, and others. There is nonstop action – a wondrous rotating Christmas tree decorated before our eyes, a believable skating moment on the rink at Rockefeller Center, a host of not-so-happy off-duty dancing Santas as seen away from their work. “Elf” is truly Josh Houghton’s show. He does, however, have excellent assistance. Leslie Hiatt is enchanting as Jovie, the Macy’s employee who becomes Buddy’s love interest. Hiatt is especially good in her “Never Fall in Love with an Elf” rendition in Act II. Also in that second act is the musical report that “Nobody Cares about Santa” provided by the dancing Santas. Maria Couch is very good as Buddy’s stepmother. Sharon Kay White is delightful as the Hobbs office employee who becomes a Buddy fan upon first meeting. Colin Alexander plays two rolls. He is a jolly and kind Santa; and a less-than jolly and less-than-kind, Mr. Greenway. The role of Buddy’s younger brother, Michael is played in various performances by Tyler Fruhwirth, Austin Golinksi and Harrison Hauptman. I saw Fruhwirth who was particularly good. Music and lyrics by Matthew Sklar and Chad Beguelin are pleasant and warm-hearted. There are no melodies that the audience hums when leaving the theatre, but “A Christmas Song” hits home. This is an anthem to family, love, memories, and the Christmas spirit. 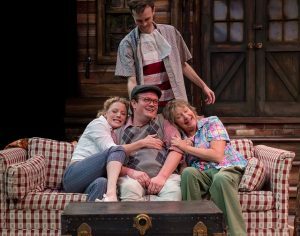 While the audience doesn’t go away humming, they do leave the theatre chuckling, when thinking of the total experience — especially incredible antics performed by Josh Houghton and entire cast in this seasonal charmer. 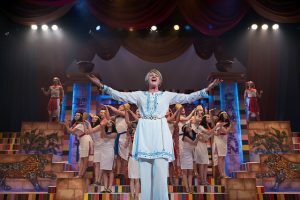 “Mamma Mia!” At Its Best As Live Theatre! Sophie is in a bind. She is about to be married, and wants to invite her father to walk her down the aisle. Problem is that she does not know who her father is. Raised by a single parent mom who runs a guesthouse on a tiny Greek island, Sophie finds her mother’s diary, learning that her mother had liaisons with three different men who just might be her father. What to do? Invite all three to the wedding! 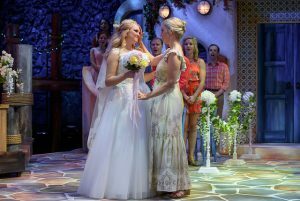 Such is a premise of the delightful “Mamma Mia!” on stage this autumn at The Arvada Center for the Arts and Humanities. It is a joy from beginning to end. 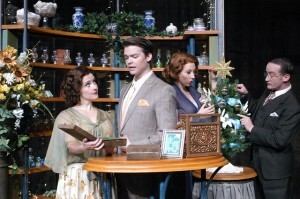 Mariah MacFarlane and Shannan Steele are both excellent as Sophie, and her mother, Donna Sheridan. Worth billing as a “cast” member is the incredible set designed by Brian Mallgrave. It is as sunny and inviting as a sunny day on a Greek island, and as warm and comfortable as a guest bedroom in a charming vacation villa. “Mamma” burst onto the stage in London in 1997 and was an instant success. The idea was interesting. Take some of the Swedish group ABBA’s already-existing hit songs, weave them into a basic story of young love, and magic pops out of the magician’s hat! Music and lyrics are by Benny Andersson and Bjorn Ulvaeus, with book by Catherine Johnson. It premiered in London in 1999 and became a worldwide sensation. It opened in New York City in 2001 and played 5,773 performances before closing 14 years later. The 2008 movie version is reportedly the most successful movie ever shown in England. As wedding guests arrive, we meet several young friends of the engaged couple, two of Donna’s longtime “best friends,” and the three possible fathers, not realizing why they are invited, and not realizing they may have fathered a beautiful daughter – about to be wed.
Then there is the ever-welcome music – “I Have a Dream,” “Thank You for the Music,” “Mamma Mia,” “Dancing Queen,” “The Winner Takes All,” “I Do, Do, I Do,” and many more. MacFarlane and Steele headline the always-entertaining cast, with additional sensational performances by Kitty Skillman Hilsabeck and Piper Lindsay Arpan as Donna’s friends, Rosie and Tanya, with Daniel Robert Sullivan, Mark Devine and Jeffrey Roark as the unsuspecting potential father of the bride. Hilsabeck also provided the highly appreciated toe-tapping choreography. The set, direction, and performances are not the only marvels. The orchestra, lighting and costumes are all equally impressive. 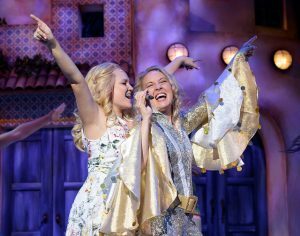 If the thunderous applause from the opening night Arvada audience is any indication, tickets to “Mamma Mia!” are going to be difficult to find. This is a joyful experience, and the audience was hesitant to let the performers leave the stage. Where: Main Stage, Arvada Center for the Arts and Humanities. On a wall of the Art Institute of Chicago hangs an enormous work – “A Sunday Afternoon on the Island of La Grande Jatte.” The painting by George Seurat is about eight feet by ten feet, and is his view of Parisians relaxing in a park on an island in the Seine in the late 1800s. Seurat was a 25-year old Parisian painter who worked the next two years to complete the project. He did not use the traditional brush strokes, but affixed each speck of paint dot-by-dot, spearheading the pointillism movement. The painting did not meet with great acclaim, but has subsequently been accepted as one of the art masterpieces of the 1800s. 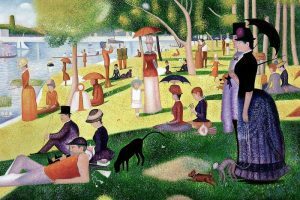 “Sunday in the Park with George” is a remarkable fictitious account of what constitutes art, reminding us that “art isn’t easy,” and showing the torment Seurat went through, causing grief for himself and all those around him while completing the painting. Cole Burden is excellent as the tormented and tormenting George Seurat. He has no patience with himself or with his models as his “art” is everything. He is also a perfectionist who toils endlessly over getting his “dots” just right to create appropriate color in the eyes of the beholder. 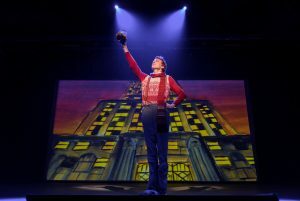 His “Finishing the Hat” is among the finest Broadway scenes in memory. Object of much of his ranting is his model, Dot. Emily Van Fleet is a wonder as the not-very-educated young model who wants more than anything to be a dancer in the “Follies,” and complains incessantly that “It’s hot out here,” standing still in the French park while George immortalizes her on canvas. She wants to be educated and does retain a book of her notes about grammar. 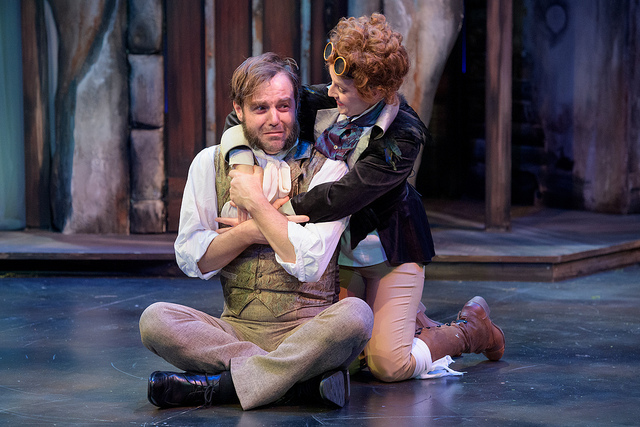 Any act would be difficult to follow what transpired before the curtain fell on Act I. Rod A. Lansberry, director of the current Arvada production, has done wonders in bring Act II to life, instilling it with emotion and beauty that were lacking in the original show. This act takes place 100 years after conclusion of the painting. George’s great grandson, also named “George,” is living in Chicago and has become an artist. Not with oils but with mechanics and lights. He is being honored at a reception at the Chicago Art Institute, home of the “Grand Jatte” painting, and is surrounded by persons wishing to be seen near him, even some who might honor him with a commission for future work. The original George was not honored in his lifetime, and none of his paintings sold while he was alive. At the base of the now-considered masterpiece “A Sunday on the Island of La Grande Jatte,” his great grandson explains how the concept of art has changed so dramatically in past years, with the artist now having to devote too much of his time in finding funds. 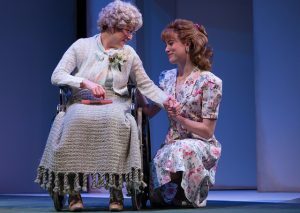 Emily Van Fleet, Dot in Act I, now returns to the stage as the wheelchair bound grandmother, Marie. She has come to the Art Institute where George is being honored and lapses in and out of reality in her memories of the past. Again, Van Fleet is mesmerizing. “Sunday in the Park with George” opened on Broadway in 1984 and in London two years later. It has gone on to productions worldwide and major revivals in New York and London. It received the Pulitzer Prize for Drama in1985, the ninth musical in history to be so honored. 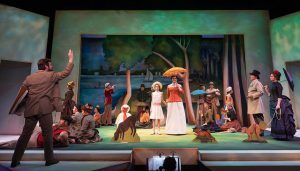 The current production at the Arvada Center for the Arts and Humanities is full of beauty; the music, the lyrics, the staging, the lighting, and the costumes. The finale of Act I remains as glorious as ever, but now Act II provides its own beauty. As the story concludes, George looks back and notes, “White, a blank page or canvas. His favorite. So many possibilities.” “Sunday in the Park with George” is a treasure all its own. Jatte” painting, completing it two years later. His model/mistress was Madeleine Knobloch (known as “Dot” in the musical). She did not marry another and move to America as Dot does in the musical. George and Madeleine had a son. The son and George died within two weeks of each other when George was only 31. Madeleine was pregnant when George and their first son died. The second son died shortly after birth. The “George” of Act II in the musical, supposedly the great-grandson of the painter, is an invention and never existed. “Yes,” he claims, “I look handsome. I look smart. I am a walking work of art, such a dazzling coat of many colors. 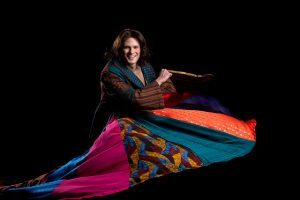 How I love my coat of many colors.” So sings Aaron Young as Joseph, as he unabashedly taunts his 11 brothers with his new robe. Seems Joseph is the favorite son of his father, Jacob, and wears his new coat with great élan. Too much élan, as the brothers devise a plot to not only rid themselves of Joseph’s coat, but of Joseph himself. Joseph does more than annoy his brothers with his fancy coat, he sings about it with an “amazing” voice. Rarely has Joseph sounded so good. Sound familiar? The story of Jacob and his 12 sons has been around since the Bible began. There were Reuben, Simeon, Levi, Naphtali, Issachar, Asher, Dan, Zebulun, Gad, Benjamin, Judah, and Joseph – his father’s “favorite son.” The musical version, crafted by Andrew Lloyd Webber and Tim Rice, seems to have been around “forever.” But it has been less than 50 years since they worked on a little show for a boy’s school in London – a little musical fable which originally lasted about 20 minutes. The “little show” has been expanded substantially and has become one of the most successful musicals in history. 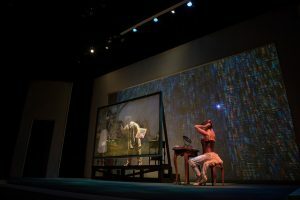 The Arvada Center for the Arts and Humanities has produced the show six times in previous years, but not since 2009. 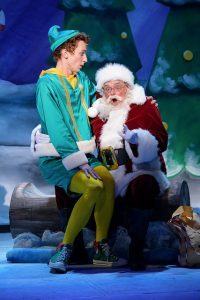 When I learned it was to be the Center’s Holiday Musical, my initial reaction was “Ho Hum. Not very Christmassy.” How wrong I was. No, it does not have a Holiday theme, but is perhaps the best “present” that the Center could provide to audiences this season. It is a joy to see and to hear. The show has sometimes been stylized so severely to be hardly recognizable. Director Gavin Mayer has wisely gone back to the more traditional performance, and has provided a show for the ages. The excellent performer Aaron Young is in great company, as the entire cast is talent to be reckoned with. 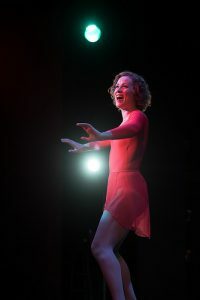 Sarah Rex played the Narrator several years ago in Arvada, and has returned to charm the socks off the audience and to raise the roof with her voice. 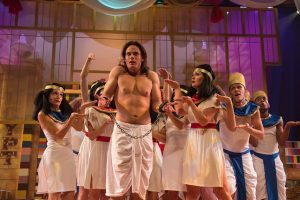 Stephen Day is excellent in two roles – that of Jacob and as Potiphar. Norrell Moore is an alluring and temping Mrs. Potiphar. James Frances gets “all shook up” as the (Elvis Presley) Pharaoh. 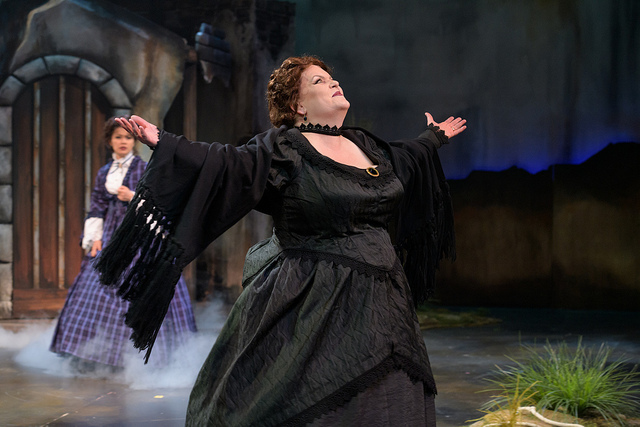 Kitty Skillman Hilsabeck provides the delightful chorography, with Roberto Sinha as Musical Director, and Brian Mallgrave as Scenic Designer. Lighting is by Sean Mallary, sound by David Thomas, and Costumes by December Mathisen. Where: Arvada Center for the Arts and Humanities. Charlie Baker is a well-meaning copy editor in London. He hasn’t had much of a marriage. His wife of many years has found him to be incredibly boring, so boring that he is beginning to agree with her. She is seriously ill in a hospital, but doesn’t care to have him around, and is glad to have him out of the way for a few days while he accompanies a friend on a trip to the USA. Charlie’s friend, Froggy, is an explosives expert in the British military and takes Charlie with him to Georgia, leaving him in a rural hunting lodge while he goes to on his explosive training assignment. Charlie is traumatized by the thought of being left alone, perhaps requiring him to engage in even minimal conversation. Froggy hatches a plan, telling the lodge owner that Charlie is a “foreigner,” does not speak or understand ANY English, and must be left alone. Unfortunately, while pretending to not understand nor speak any English, Charlie overhears some conversations among the lodge’s guests that he should not have heard. The “foreigner” ruse is beginning to have serious implications. The ensuing two and one-half hours are a delightful, and sometimes-sobering look, at how we feel about foreigners amongst us. Charlie goes through the machinations of understanding nothing, and becoming involved in pantomiming what he needs, while the guests speak louder and louder, as if that will help him understand. Sammie Joe Kinnett is astonishing as the boring Charlie Baker. He becomes incredibly alert in his silence, and ultimately has positive effects on everyone around him. Josh Robinson is believable as Froggy, Charlie’s military friend who creates the “foreigner” image for his friend. A great foil for the speechless Charlie is Ellard Simms, the maybe-mentally-challenged brother of a guest in the lodge. 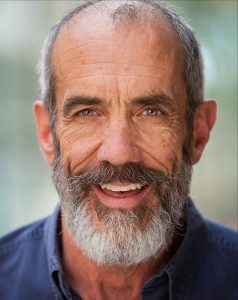 Lance Rasmussen is super as Ellard. Ellard and Charlie have great scenes together including an over-the-top breakfast when they try to outdo each other in figuring out what the other is trying to relate. Their hijinx end up with each holding a glass on their heads – for no apparent reason except to enjoy the incredible happiness of finding friendship. Ellard believes that Charles might just be smarter than he appears to be, and vice versa. Ellard decides to teach Charlie how to read English – in just three days! And while immersed in his own bubble of disbelief, Charlie realizes that he is not so boring – and that he actually has a personality. 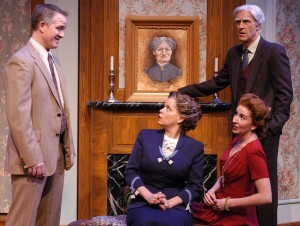 Pictured L-R: Jessica Robblee (Catherine Simms), Sammie Joe Kinnett (Charlie Baker), Standing – Lance Rasmussen (Ellard Simms) and Edith Weiss (Betty Meeks). The entire cast is uniformly excellent. Edith Weiss is very good as Betty Meeks, the lodge owner who has no knowledge of anything outside her bit of rural Georgia. Greg Ungar is the mean-spirited county inspector, eager to condemn the lodge property. Zachary Andrews and Jessica Robblee are the Reverend David Marshall Lee and his pregnant girlfriend Catherine. Lee has designs to buy the lodge and turn it into a White Supremacy headquarters, using money from his heiress girlfriend. The girlfriend, Catherine, is accompanied by her half-witted brother Ellard, who just might be brighter than appears. 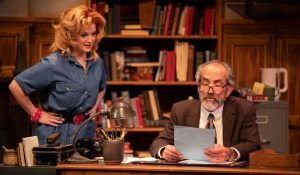 The clever play, written by Larry Shue, premiered at Milwaukee Repertory Theater and opened off-Broadway in 1984, directed by Jerry Zaks. Initial response was not overly-enthusiastic, but gained word-of-mouth momentum. 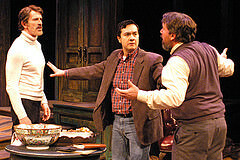 It received Obie and Outer Critics Circle Awards, including Best New American Play. Playwright Shue died in a plane crash in 1985, not realizing the success the play would ultimately receive. The play has gone on to receive worldwide acclaim. The Arvada production is directed by Geoffrey Kent, with the set designed by Brian Mallgrave. The mood of the production is in constant flux – from high hilarity to somber realization that evil remains among us. The ultimate result is one of inspiration and hope – with the understanding that each of us has potential of being an influence for good – often when we least expect it. “A Chorus Line” — Better Than Ever! Is it possible for a musical to turn up now, looking even more vibrant and exciting than when it was the toast of Broadway 40 years ago? Yes! The Arvada Center continues its run of providing excellence to Colorado theatregoers. 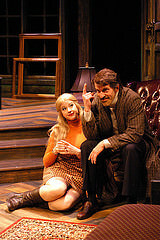 The show’s director, Rod A. Lansberry, has produced or directed more than 100 productions. When, oh when is he going to get it right? Just about always! “A Chorus Line” is a marvel. Lansberry does have help. Kitty Skillman Hilsabeck’s success choreographing or directing more than 40 shows is evident as she has the dancers performing at their peak. There is evidence of work of the show’s original director Michael Bennett, but she has personally provided most of the current production’s terrific dancing. In the summer of 1975 an unusual musical opened on Broadway. For years the backbone of New York shows had been the singers and dancers who were highly entertaining, but not the stars. This changed when some Broadway dancers hosted some workshops about their efforts. Performer Michael Bennett became involved and took over the effort. The dancers’ personal stories were put into a format which ultimately became “A Chorus Line.” Bennett went on to direct the Broadway production, with Bob Avian as co-choreographer. The book was by James Kirkwood, Jr. and Nicolas Dante, with music by Marvin Hamlisch and lyrics by Edward Kleban. Response to the show was electric and immediate. It tells of dancers auditioning for an upcoming Broadway production. The tough director Zach puts the wannabee performers through a series of tryouts. The group is narrowed down to 17 dancers, of which only four males and four females will be selected. Zach asks the finalists to tell their stories, why they want to dance, where they come from, and anything they want to talk about. The results are an intriguing two hours of incredible dancing and soul-searching memories. Stephen Cerf is excellent as Zach, the director and choreographer auditioning the potential performers. Jean-Luc Cavnar-Lewandowski is also very good as his assistant, Larry. They are both talented performers, and keep the action moving. 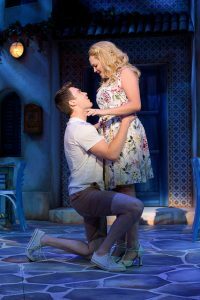 Many of the songs have become Broadway classics, including “One,” “What I Did for Love,” ”At the Ballet,” and “Hello Twelve.” Interwoven with the dancers’ stories is the past romance between director Zach, and Cassie, one of the auditioning dancers. A highlight is Cassie’s breath-taking, “The Music and the Mirror.” The “mirror” is used frequently as a backdrop to reflect the dancing brilliance. 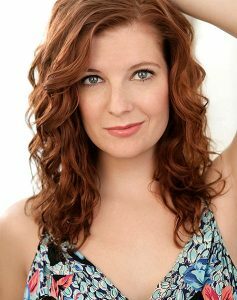 Cassie, played by Dayna Tietzen, has the largest role of the group, as her relationship with Zach is an integral part of the show. 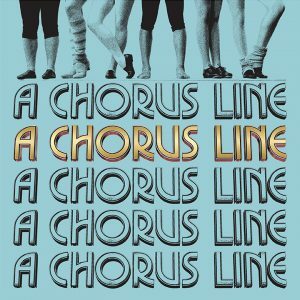 The original “A Chorus Line” ran in New York City for 6,137 performances – the then-longest-running musical in Broadway history. It has been seen worldwide, and was made into a movie in 1985. Unfortunately, the movie version lacked the incredible spark a live performance can provide. When I saw the original Broadway show, I was impressed. I was more impressed this season with the current presentation on stage in Arvada. This is more than “One Singular Sensation.” It is a two-hour display of brilliant talent. The current production in Arvada is every bit as thrilling as that presented on Broadway in 1975. Familiar Show Has Never Sounded or Looked Better! 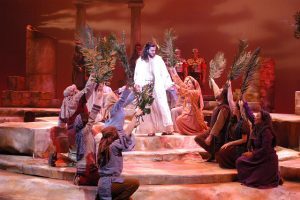 From the moment the audience sees the incredible set, until the story concludes, there is a reverent awe with the never-better production of “Jesus Christ Superstar.” Director Rod A. Lansberry has outdone himself with this brilliant show. 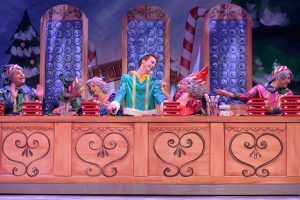 Based on the assumption that “There’s No Place Like Home for the Holidays,” a creative team has been working for nearly a year to bring “I’ll be Home for Christmas” to the stage at Arvada Center. 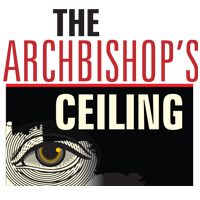 This is the first time the Center has provided a world premiere of an original production. Book is by Kenn McLaughlin, with lyrics and original music by David Nehls. Some of the music includes familiar Christmas tunes – arranged to provide opportunity for excellent dancing. Gavin Mayer directed the show with Kitty Skillman Hilsabeck providing the choreography. Beware of scams. Hang up when a supposed IRS agent threatens to take away your home. Don’t offer your social security number or other information that could be used to defraud you. And be especially on the lookout for Tartuffe. He is the pious beggar at the doorstep with mystifying charm – promising eternal salvation. Orgon, the family patriarch, believed him, took him into his home; and the scammer soon had Orgon and his doting mother under his spell. The rest of the family was aghast. Those nuns and a “novice” make rock and roll habit-forming! Getting into the “habit” can be risky business. Staying there has difficulties of its own! Many nuns in this show face a variety of challenges. One possible new addition, Deloris Van Cartier, has a specific concern — being “chased” (by the mob). Deloris is a flashy vocalist longing to become a pop star. Her boyfriend/manager is a mob boss, Curtis Jackson, who is watching her perform in a Philadelphia nightclub. Deloris is a glamorous woman with a huge voice, but the evening doesn’t go well. Curtis advises Deloris that she is just not yet ready for the big time. Playwright Jeffrey Hatcher wasn’t wild about athletics. In fact, at nine he was happily enrolled in a local etiquette class to get him away from playing little league baseball! He excelled in etiquette school, with his goal to receive a perfect “100” grade upon course completion. Hatcher’s memories of his youth in the class are wild tales now on display at the Arvada Center. His two-character play is a delight. Leslie O’Carroll portrays Mrs. Mannerly, etiquette teacher with 30 years of experience teaching manners to the citizens of Steubenville, Ohio. Graham Ward is the precocious student, Jeffrey, and also portrays other students in the class. 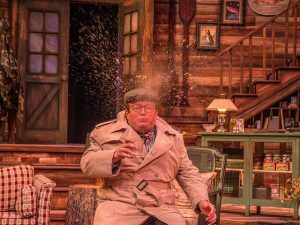 O’Carroll is a longtime favorite of Colorado audiences; and Ward should soon be a name to be reckoned with, as he is basically a comedic riot in the making. The etiquette class has seen better days, and appears to be on its last leg as Jeffrey’s session begins. By now it has only five students, including Jeffrey. They are a mixed bag, with only Jeffrey having any intention of completing the course, hopefully receiving the perfect “100” score. He is well on his way as the class brown-nose who is the instant teacher’s pet. O’Carroll is convincing as the teacher who as “seen it all,” and is discouraged as basic values and manners appear to be diminishing in Steubenville. Ward is a sight to behold. He appears to have no bones in his body, and he bounces from playing one character to the next, throwing himself from one end of the stage to the other. He is also a devious chap, partially responsible for the exit of other students from the class. Want to learn how to properly set a table? Ask Mrs. Mannerly. Want to know how to use a fork and a knife in Europe vs in America? Ask Mrs. Mannerly. Want to know how to foil the class’s best table-setting student? Ask Jeffrey. Mrs. Mannerly’s instructions include more than manners. She also teaches values, and telling truth from fiction. Jeffrey has reason to believe that his teacher hasn’t been teaching with a clean slate, and sets out to prove his theory. Edith Weiss has skillfully directed this delightful tale, that ends up looking at the value of values as well as the value of manners. She has skillfully held O’Carroll in tight control as the teacher in charge, and skillfully lets Graham Ward let loose to delight the audience. The set is pleasant, as the class is held upstairs in a building which formerly contained a basketball court, with the basketball markings still present. Jeffrey Hatcher grew up in Steubenville, Ohio, so is well acquainted with the goings-on in his hometown, and gently reflects upon his interesting youth in this part of Ohio before moving on to New York and then Minneapolis after attending Denison University in Granville, Ohio. 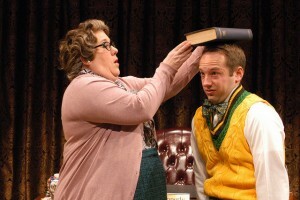 He is an award-winning playwright, with the wild and crazy class of Mrs. Mannerly just one of his compositions. “Mrs. Mannerly” is played without intermission, with a running time of about 80 minutes – with the audience obviously entertained and “instructed” throughout! “White Christmas” is Melodic Look at Holidays Gone by! Michal and Williams are talented performers – song and dance men. The characters they play have remained friends and have become respected entertainers in New York, ten years after the battlefront show. Thus sets the stage for an evening of Irving Berlin music, remarkable choreography, and a nostalgic look at what patriotism meant to America’s citizens and soldiers. Songwriter and composer Irving Berlin was born in Russia in 1888, moved to America with his family and is widely considered one of the greatest songwriters in American history. His songs include such hits as “Easter Parade,” “This is the Army, Mr. Jones,” “There’s No Business Like Show Business,” “A Pretty Girl is Like Melody,”and the immortalized “God Bless America.” Berlin was raised in poverty and was forever in love with America and the opportunities it provided to him! His song, “White Christmas” first appeared in a 1942 movie musical, “Holiday Inn” about a country inn opened only on holidays. The song was performed by a crooner named Bing Crosby. 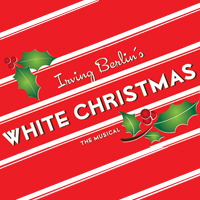 It was an instant hit, and resulted in being the theme of a l954 Paramount Pictures movie musical, “Irving Berlin’s White Christmas,” again starring Bing Crosby. His recording of the song continues to be the most-sold single in recorded music history. 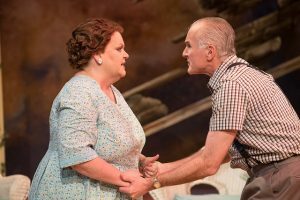 The movie was the biggest money maker in 1954, and generated the stage version which premiered in San Francisco in 2004 and has played in various venues including Broadway in 2008 and revived again in 2009. New York theatre critics were not impressed with the stage musical version, but audiences have been enthusiastic. The Arvada production is excellent – bringing to life the mood of the 1950s, and showcasing some of Berlin’s well-known standards. 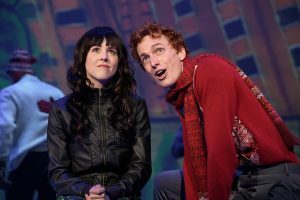 The creation of the show revolves around using many of Berlin’s hit songs to advance a basic boy loves girl, girl loves boy story. They spar, leaving doubt as to how their relationship will conclude. The show can be a bit too talky, but once the music takes off, the show is very pleasant. Some of the musical numbers sometimes don’t quite fit into the plot line, but the “I Love a Piano” routine which begins the second act is as terrific as any in recent memory. Kitty Skillman Hilsabeck is credited as choreographer. She brought down the house with her disco action recently in Arvada Center’s “Saturday Night Fever,” and brings her clever ideas to “White Christmas.” The entire production is under the direction of Gavin Mayer who has put together a very talented cast in providing holiday cheer to Northern Colorado. 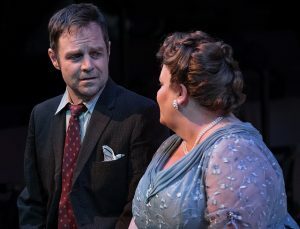 Ben Michael and Cody Williams are the production’s stars, assisted greatly by Lauren Shealy and Erica Sweany, as their love interests, Paul Page as General Henry Waverly, the enthusiastic Sharon Kay White as the Vermont Inn Manager, and Darcey Keating as the General’s granddaughter. The granddaughter role is double cast, with Keating and Darrow Klein sharing the role. I saw Keating who was super, and very convincing as a young wannabee actress.. The song and dance team are ready to travel south by train from New York to Miami for some rehearsals for a new show, but end up going north to the “Snow” of Vermont, following two girls they just met.. Coincidentally they end up in the country inn owned by the now-retired General Waverly. Lack of Vermont snow is currently a great problem to Waverly’s maintaining ownership of the Inn. Bob Wallace and Phil Davis are concerned about the financial plight of their former commander. So, as Mickey Rooney and Judy Garland used to say in early movie musicals, “Let’s put on a show.” Unbeknownst to the General, the two soldiers from his past put together a show for the Inn, inviting everyone from their former army days to bring revenue to the resort. Elwood P. Dowd is an affable chap – entirely without guile, and a friend to everyone. His very best friend, however, is a 6 foot one and one-half inch rabbit named “Harvey.” Harvey is actually a pooka, conjured from Irish folklore. Elwood takes Harvey with him wherever he goes, searches for him when he becomes lost and the two are evidently great drinking buddies. Elwood has now transferred his love for his mother to the less appreciative sister. Veta Louise is an avid social climber, longing to host parties and to be invited to others. Everything must be properly perceived. She is viciously afraid that Elwood will turn up with his unseen friend Harvey, and proceed to introduce him to everyone . Her daughter, Myrtle Mae has her own challenges, as she believes that everything wearing pants might be the love of her life. Veta Louise decides that she has had “enough” of the kindly Elwood and his tall rabbit friend and arranges to take him to a nearby sanitarium where she will admit him to stay forever. This also provides a path for her to gain ownership of the house. 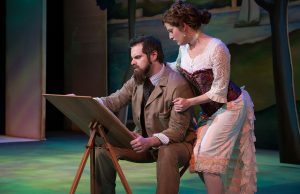 Gavin Mayer and Ron A. Lansberry, director and artistic producer for the show, have assembled a delightful cast of wonderfully talented performers to bring this sometimes frenzied tale to life on the Stage of Arvada Center. Torsten Hillhouse is a jewel as the mild mannered Elwood Dowd. He has no desire to cause anyone any trouble and is quite willing to do whatever his sister suggests. 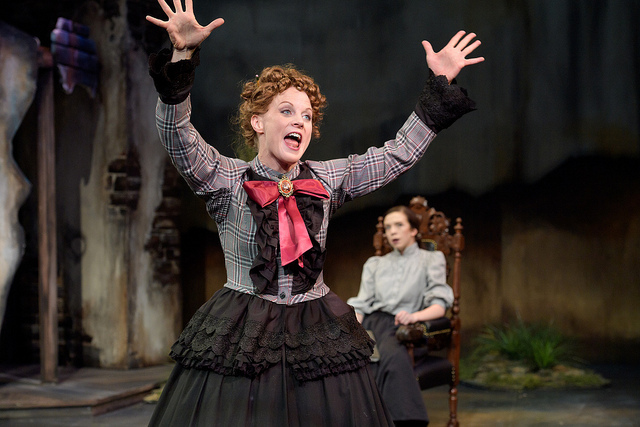 Elwood’s sister, Veta Louise, is in a delightful frenzy, as played by Kate Gleason. She is eager to have Elwood and his rabbit out of the house, and wants her daughter Myrtle Mae, to similarly disappear, hopefully with a husband! 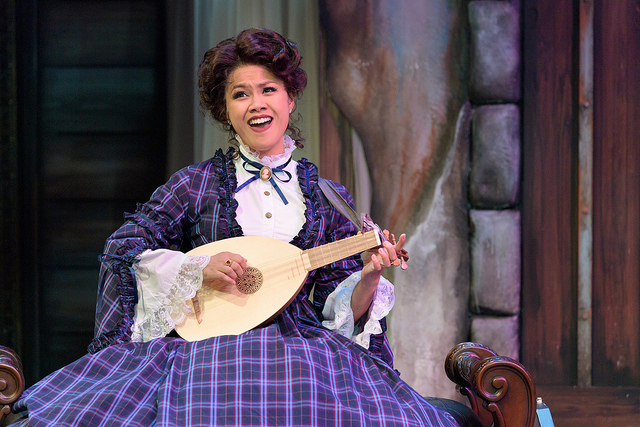 Missy Moore is a delight as the awkward daughter, Myrle Mae. She is a fine comedian, while not letting the part become camp! Insanity reigns as Elwood’s sister,Vera Louise, is erroneously admitted to the sanitarium instead of Elwood. Staff cannot believe that someone as kind and caring as Elwood might need psychiatric care, where as his sister appears to be completely nuts! The cast is universally believable. Graham Ward is a fine physical comedian as the sanatorium doctor who is trying to figure out who needs mental care and who doesn’t. His boss, played by Jeffrey Roark prefers not to be bothered with any details of activity in the sanitarium, but does become intrigued with the idea that Elwood’s rabbit friend just might provide a two week out-of-this-world experience to be with someone more exciting than his wife. The only person not worried with problems is the affable Elwood Dowd, who wants nothing more than to please everyone! “Harvey” was one of America’s best-loved plays in the 1940s and Marcy Chase received the Pulitzer Prize for Drama in 1945. It has been adapted for film and television several times, best remembered from the James Stewart performance as Elwood in the 1950 movie. Chase has roots to Colorado, graduating from Denver’s West High School, and later studied at the University of Denver and University o Colorado Boulder. Everything involved with this production is flawless. The amazing set by Brian Mallgrave is changed before our eyes from the Dowd home to the Sanitarium in Act One and again in Act Two — each time receiving applause as if it were a character in the show! By show’s end it just may be that Elwood (and his rabbit friend) are the only truly normal characters around. Veta Louise even admits that she just may have seen the the pooka ! 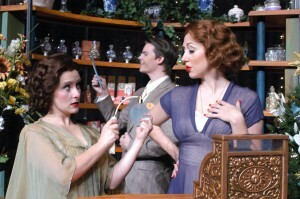 Maraczek’s Parfumerie in the 1930s Budapest is an attractive location for the entertaining “She Loves Me” now on stage at the Arvada Center for the Arts and Humanities! The parfumerie is initially shown from the outside beginning with a warm summer day, and continuing through the falling of autumn leaves, and the welcome snow of the Christmas Season. When the set’s interior opens the audience is drawn into the splendid interior. No detail is missing in the shop’s displays. 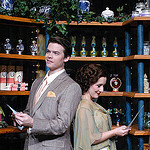 The current musical version, “She Loves Me” (as seen in Arvada this season) is based on the 1963 Broadway musical by Jerry Bock and Sheldon Harnick. Life was somewhat more simple than the world of today. Girl and boy meet, fall in “hate” – or is it just thinly disguised “love”? The shop’s staff is a well-trained group of clerks, when looking-for-work Amalia Balash arrives on the scene, in search of a job. Julia Jackson is heartwarming as the eager Amalia. 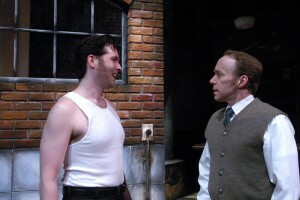 Mark Rubald is very good as the shop owner, Mr. Maraczek. He isn’t interested in any new staff, but finds Amalia so capable that he gives her a chance! 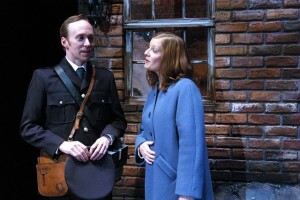 Amalia’s arrival on the scene is not warmly received by clerk George Nowack, excellently played by Andrew Russell. He finds her particularly offensive, as he lives in a dream world. He has been responding to lonely-hearts ads in the newspaper and believes he is in love with a “Dear Friend” that he has never met! An especially talented cast has been assembled for this wintertime/Christmas gift to the community. Joining with Julia Jackson, Mark Rubald and Andrew Russell are supporting leads and each is given a chance to shine! Clerks in the shop include Ilona Ritter, delightfully played by Jennifer Lorae teamed opposite Gregory Gerbrandt as Steven Kodaly, a snake-in-the grass lech who believes that he can charm his way to whatever he wants. Parker Redford plays the young Arpad Laszlo, wanting to be more than a delivery boy. And Rob Costigan is a marvel as the experienced and insecure elder clerk, Ladislov Sipos. A comic delight is Stephen Day as the waiter in the cafe where the two “Friends” are set to meet. The”meeting” turns into a great scene where the waiter is trying to keep some sort of decorum, reminding everyone that the cafe presumes to provide a “Romantic Atmosphere” while chaos reigns!”The entire cast is flawless, with not a mis-step anywhere! There are no “hit” songs in the show, but the music is very rewarding “Dear Friend” “Vanilla Ice Cream” and “She Loves Me” are especially memorable! The production is directed by Gavin Mayer, with David Nehls as musical director. Kitty Skillman Hilsabeck provides the excellent choreography. Lighting is by Vance McKenzie, with sound by David Thomas. 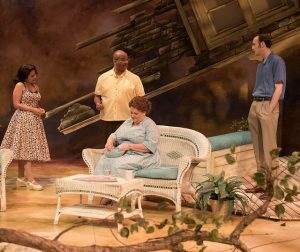 The beautiful set is credited to Brian Mallgrave, as scenic designer. The set not only includes interior and exterior of the perfume shop, but also a hospital room, Amalia’s bedroom, and a super cafe – scene of raucous of comedy. The cast is large and all are excellent, as is the orchestra under direction of David Nehls. 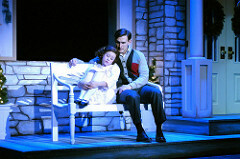 “She Loves Me” is a charming addition to the Holiday Season!